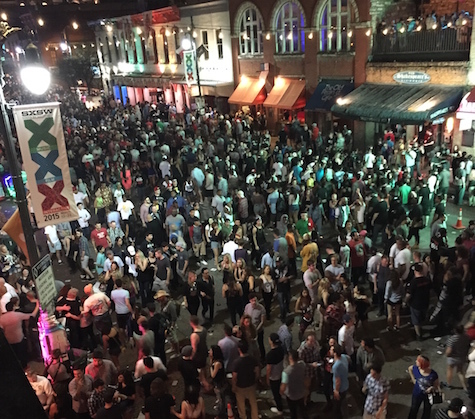 Looking down on Sixth Street from Maggie Mays at South By Southwest 2015. This year’s SXSW kicks off today. The annual South By Southwest music festival is kicking off in Austin today. I would be remiss in not saying it pangs me not being there this year, especially since they’re having 90-degree weather in Austin. The weather at SXSW has blown the past couple of years. Lots o’ people from Nebraska will be down there. Taking my place (and Chris Aponick’s place) representing/reporting for The Reader is cartoonist Paul Trap. Paul is known first and foremost as the dude behind syndicated comic strip “Thatababy,” which I believe is carried in more than 100 newspapers nationally. Paul also is a huge indie music fan. If you’ve gone to shows locally over the past few years you’ve probably seen him. When he told me he was going to try going to SXSW this year without a badge I suggested he get one from The Reader and be their correspondent. He took my advice (and so did The Reader), so you’ll be seeing Paul’s updates throughout the week, starting with this one. I’ll post links to more of his updates as they go online. I can’t wait to see how he illustrates this year’s SXSW for the printed version of The Reader. Of course Hear Nebraska is going to have a bevy of writers and photographers on hand this year as well. You can follow their hi-jinx at hearnebraska.org. No doubt they’ll be covering Lincoln’s Nebraska Exposed showcase, which takes place tomorrow. And as always, the Omaha World-Herald‘s Kevin Coffey has conned his paper into sending him to Austin on their dime (and getting paid for it). Look for Kevin’s updates via his twitter feed @owhmusicguy. Oh, what a life.